These are the golden letters to commemorate that lovely event. 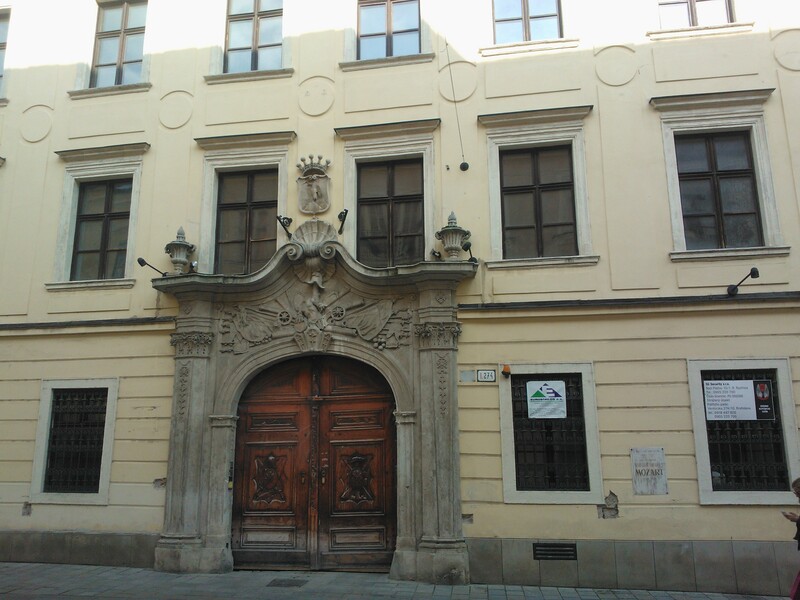 And this is the actual house in Bratislava, Slovakia where you can find this marble plaque with the golden letters inscribed (between the two windows on the right from the entrance). I just love roaming historical parts of cities in Europe, or anywhere else, for that matter. Don’t you? This entry was posted in Life/Photography and tagged Bratislava, classical, Concert, golden, House, letters, Music, plaque, postaday, weekly photo challenge, wolfgang amadeus mozart. Bookmark the permalink. Thanks for sharing this. Means so much to me. I love doing that, too. I love history. Enjoyed that shots. I like roaming in cities too. Nice gold letters on the plaque. Oooo… I am fascinated by history, and since I am not likely to actually see the plaque in person, thank you for sharing it. Wow. That’s a shrine! Thank you!! One of my favorite composers! Would love to have heard him play. great choice for this challenge. where’s this house located? Have you seen the movie Amadeus? It’s hilarious! Apart from the end of course. I loved the movie, too. Mozart was a great man, if a bit crazy. I wonder if there are still rivalries between musicians? But of course they were vying for the ear of the king and his patronage. I guess there’s not a lot of that anymore. Love your pictures of places I probably will never see. Thank you so much for stopping by and your kind words! Cheers! My wife and I got part of our bucketlist by vacationing in both Italy and Greece. To walk and see where ancient history made “History” was indeed a fantastic rush. Yes! Roaming through history….you can feel the past moving into the present. A WWII Vet told me that, during the war in Germany, he took shelter in the basement of a house one night. When he woke up in the morning, he saw the signs and found out he had been sleeping in Beethoven’s house! My favorite thing to do. Nice post! My boy could identify six Classical composers from their music when he was 4.5. He is now 7 – I showed him these shots. Thanks for liking my quote on ‘love’. It has been my favourite for years. Interesting photo!